Right: This is the private hostel hut that I chose to stay in for two nights. It was called "Dragon's Lair". 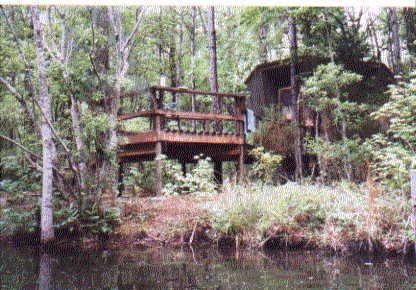 It had it's own private deck overlooking the water. 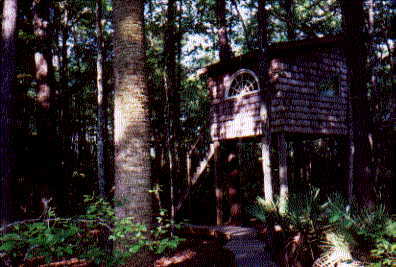 Below: Private tree houses were also available! Open & airy, with large windows opening to the forest (on the private side). April 9th had no end. Drove all night. Arrived at the Hostel in the Forest around noon on the 10th. This hostel was the second one that I had ever been in, and it was unusual to say the least. Fantastic! It was just like my guidebook, "Hostel USA", had described it. The road leading into the hostel is very rough--that was also described in the guidebook, so I was prepared for that. I wasn't going to let a few 2 ft. deep potholes stop me! And it was well worth the effort, and numerous scratches on my car! Below: View looking from inside my hut onto deck. 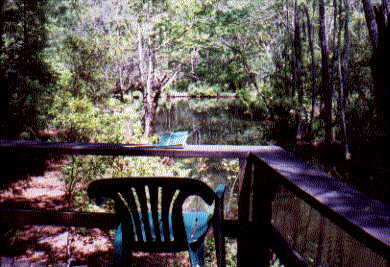 Below: View from my deck overlooking the water. 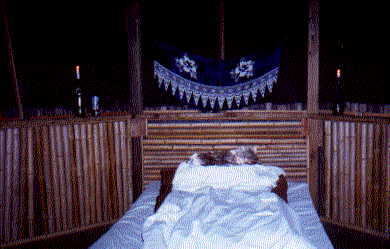 Right: Inside of the hut. Shaped somewhat like an octogon, it was screened in from waist height up on all sides so you could go to sleep listening to the crickets and other forest noises. Very peaceful. Above: The shower room. 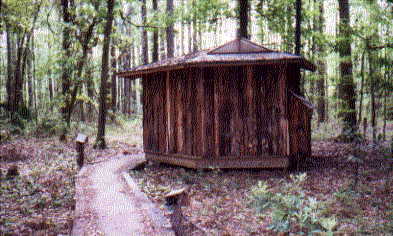 If you've even wondered what it's like to take a shower in the middle of the woods--the other side is open to the forest. I took my shower very early in the morning. Below: Here the two large geodesic domes built back in the 70's. The one on the left was being used as a dorm room with bunks. The one on the right contained the kitchen, office, ...One of the attached building contained a large, screened in poolroom. There was also a laundry, library, and a piano. 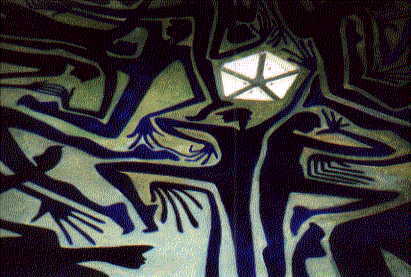 Above: The ceiling painting in the geodesic dome. 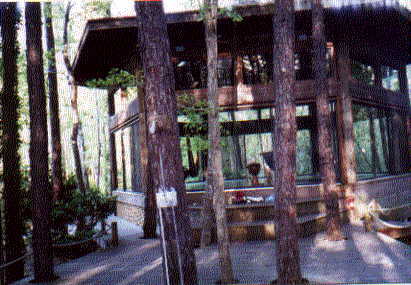 Above: Here's another building, "The Glass House". It is used for meditation & quiet reflection. 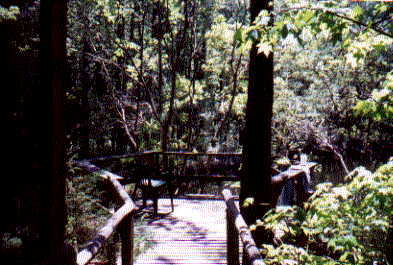 It's a short, peace walk through the woods to get there. 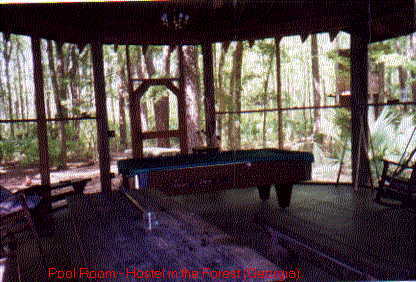 Above: The screened in pool room. NOTE: Make sure you check out their web site & understand their rules before you go there. I believe it is now memberhip based. I haven't read the new guidelines yet. If you want a quiet, serene hostel in beautiful wooded surroundings where you can relax and become one with nature, the Hostel in the Forest is the place.